THE Griffin pub in Frome will be hosting its biggest ever beer festival over the May Bank Holiday. There will be over 30 beers and ciders to try from a range of breweries together with live music over five days from Thursday 1st to Monday 5th May. 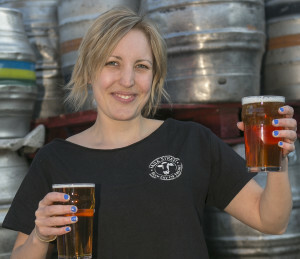 “It’s our biggest ever beer festival and will help us celebrate the 15th Birthday of Milk Street Brewery as well as The Griffin getting into the Good Beer Guide for more than 10 consecutive years,” said Ellen Porteous. “Spanning five days from the 1st May, the festival will be showcasing over 30 beers and ciders from some of the best breweries around the south and beyond. “Alongside great beer will be great music, with different acts, bands, DJs and line-ups booked for each day. From blues to bluegrass, funk to folk, there’ll be something for everyone to get moving to. And what would a festival be without some fantastic nosh?! We’ll be cooking up a whole range of cuisines to line those beer bellies and tantalize your taste buds. “The day time affairs will be a very family friendly event, with face-painting, games and activities to keep the younger ones amused, as well as raffles, exhibitions and quizzes for the grown-ups to enjoy. Saturday is packed with music alongside an all-day barbecue. The day kicks off at 12pm with Celtic Connections, followed by Josh White, DR Zeebo’s Wheezy Club, The Magic Tractor and The White City Shakers before finishing off the night with Pic’n’Mixmaster Small Paul and DJ Allday-Breakfast, ending a 14 hour day at 2am. Sunday is very much food orientated kicking off at 12pm with Sausage Sunday, with meat provided by Frome’s very own local butchers, William & Sons. A food tasting session will take place before patrons can take part in live acoustic jam sessions. Sunday will be rounded off with the Great Griffin Beer Quiz at 8.30pm. Baku Dan will be the last musical act of the festival with some afro-funk vibes from 6pm, along with food being served all day. “A relaxing Bank Holiday Monday to wind down from a jam-packed weekend,” is promised. The festival will end with the Griffin Pub’s usual pub quiz at 8.30pm.